Directions Adults and children 2 yrs. and older: Brush teeth thoroughly after meals or at least twice a day or use as directed by a dentist. Do not swallow. To minimize swallowing use a pea-sized amount in children under 6. Supervise children's brushing until good habits are established. Children under 2 yrs. : Ask a dentist. Uses Helps protect against cavities. 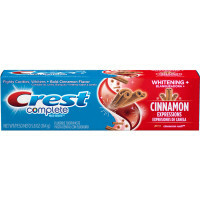 With regular brushing: fights cavities, fights tartar, freshens breath, whitens teeth by gently removing surface stains. Contains Scope to give you icy fresh breath!